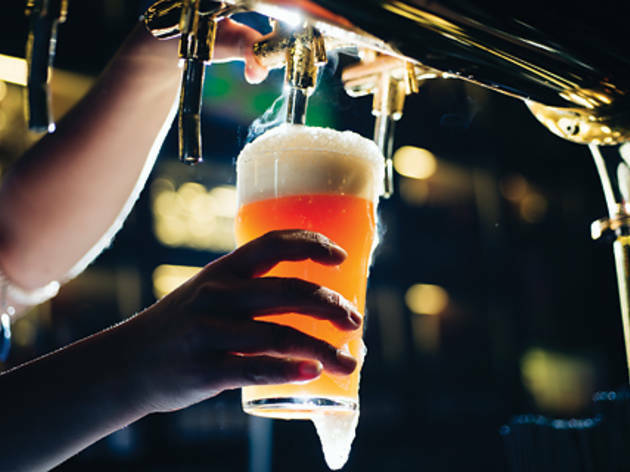 Institutional Wan Chai watering hole, Trafalgar, has taken its love of beer one step further and opened a second location at Brim 28. Taking over the space previously occupied by California Vintage, The Trafalgar Brewing Company has given the space a complete facelift, remodelling it with a British gentlemen’s club style interior, featuring dark wood-panelled walls and high-back plush leather sofas. While the original Trafalgar over on Lockhart Road has an open area for shisha smoking, a dart board and other merriment-inducing paraphernalia, the Brim 28 location is more about family dining, gatherings and of course, the beer. With the success of Beertopia, the annual craft beer festival, microbrewing in Hong Kong has finally taken flight. 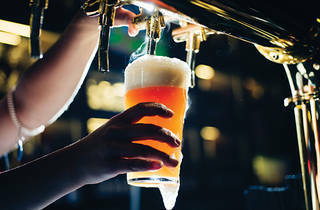 Though home brewing seems still to be restricted to a few enthusiasts (who we suspect have the space to house the brewing equipment), that hadn’t stopped local establishments, like the Tipping Point – and now Trafalgar – taking it upon themselves to pioneer a unique flavour of beer that represents our city. You know an establishment is serious about its beer when there’s a dedicated area for brewing on the premises. And nestled by the back wall of The Trafalgar Brewing Company are large copper beer kettles behind protective glass. This is the spirit of the whole establishment. They haven’t been brewing for long – actually only for the month or so they’ve been open – and unfortunately, not every brew is ready when we visit. We’re keen to try the IPA, pilsner and ale that are ready to be poured, but we’ll have to come back for other brews, like the Kiss Me Hardy stout and the White Night blanc beer. In the meantime, you can also enjoy plenty of imported beer, whisky, cocktails and more of the classics you’ll find on the menu of Trafalgar’s original bar. We start off with the Golden Mushroom ($81), a light straw-coloured pilsner with a hoppy front-end, it has a mild bitterness balanced with a malty aroma. It ends on a refreshing note, though we find the flavour a bit on the watery side. Next up is the Victory Ale ($81) and judging by the colour we assume it’s the pale kind. Testing how the Hong Kong waters fare with this finicky brew, we’re disappointed to say that this is our least favourite of the lineup. The usual complex bitterness and malt of a pale ale is faint and again, we find the beer watery on our palates. The Hops & Glory IPA ($81) fares much better. With a thick, smooth foam, the hops give way to a fruity floral bouquet and, when paired with our crispy calamari bites ($69), evolves into a citrusy aroma. We’re very excited to have another dedicated brewing establishment in the city, and we look forward to seeing what other ales, lagers and ciders Trafalgar will come up with. For true ale enthusiasts, there is nothing better than hopping around town in search of truly unique beers.